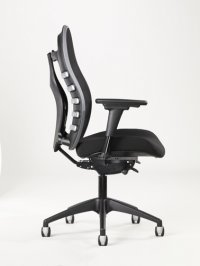 The CPOD 571 by Canadian Allseating combines a unique blend of back adjustability with high quality and comfort. A unique 5 strap back system allows for individual tightening at each strap via a ratchet system – the tighter the strap, the more firm mesh at that strap point, thus more support. Combining this patented backrest feature with a molded contoured seat and optional ergonomic add-ons allow the CPOD to be individually built and adjusted per the user’s specific ergonomic needs. Control options: Deluxe Tilt J Bar – Deluxe Synchro Tilt – Deluxe Synchro Tilt w/ Back Angle – Arm options: Task 2 Arms: adjustable 4″ height and 4″ width, pivots and slides side to side and front to back – Twister Arms: height adjustable 4″ and pad rotates 360 degrees (Add Adjustable Width Brackets for Width Adjustment).